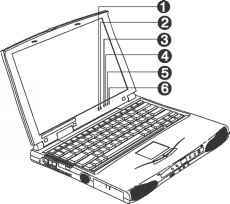 This chapter contains step-by-step procedures on how to disassemble the notebook computer for maintenance and troubleshooting. To disassemble the computer, you need the following tools Wrist grounding strap and conductive mat for preventing electrostatic discharge Flat-bladed screwdriver or plastic stick NOTE The screws for the different components vary in size. 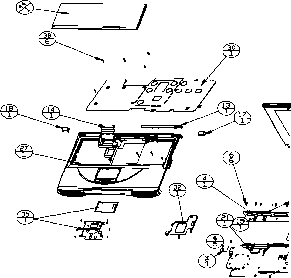 During the disassembly process, group the screws with the corresponding components to avoid mismatch when putting back the components. The computer has six easy-to-read status indicators (LEDs) under the display screen. The Power and Standby indicators are visible even when you close the display cover so you can see the status of the computer while the cover is closed. Blinks when a battery-low condition occurs. Lights when the computer enters Standby mode. Lights when the floppy drive, hard disk or CD-ROM drive or DVD-ROM drive is active. Lights when the battery is being charged. Lights when Numeric Lock is activated.